I used exactly 1 ball of Rowan Big Wool with only a couple of yards left over. 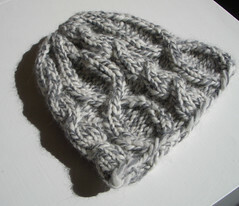 The hat is a bit small on me; I misread the instructions and used size 10.5 needles instead of size 11. (But then I might have run out of yarn.) Rowan Big Wool is kind of hard to work into cables because it’s not very elastic. It’s very soft. Cute! I'm much amused by the fact that the first photo looks B&W. Thanks, yeah, that turned out cool. If you look at the largest size, it's clearly not, but all the smaller sizes do look B&W. Size 11 would use less yarn that size 10.5 to make a hat of the same size. 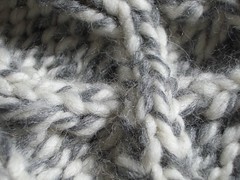 The gauge would be larger and more airy, therefore using less yarn. Smaller needles use more yarn for fabric of the same size. Oh, very cute! I like the crossed cables. It's lovely yarn. Thanks again!